In American Women: Birds of im/Migration, curated by Susan Hillhouse Leask, Sara Friedlander combines her own photographs with vintage photos and paint to create compelling mixed media works that explore the lives and celebrate the valor of the brave women who left home, country, and family to carve out new lives in the United States. In the artist's words: "Most of them spoke no English, and holding steadfast to their hopes for a brighter future, they faced daunting challenges in order to establish themselves in this new world." 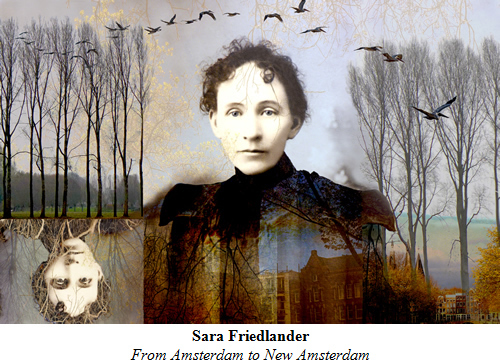 Friedlander's first work in this genre centered on her maternal grandmother, Masha Bornstein, who in 1908 at the age of 15 traveled alone in steerage to Boston from Belarus. Friedlander learned to know her grandmother through the process of creating this work. 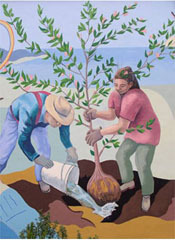 The artist invites us to delve deeper into our preconceptions, reminding us that we are a nation of immigrants: "At this critical time, when immigration is seen as a national and global threat throughout the world, these portraits can help us remember and reflect deeply on the reality that most Americans . . . are relatively recent descendants of immigrants or immigrants ourselves." Friedlander has explored many aspects of photography. Other bodies of work include Subway Reflexions, Rushing to See Art, Stonewalled in Jerusalem, and Blurred Landscape. She has exhibited widely in California, as well as nationally and internationally, and online, and in 2012 was awarded first place in the 2012 Annual International Competition held by the Center for Photographic Art in Carmel. To learn more about the artist and her work, come to the Artist/Curator Talk on closing Sunday, Feb 11 at 3:30 pm.